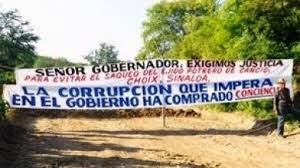 Twelve people from the small community of El Potrero de Cancio in the municipality of Choix, in the state of Sinaloa, Mexico, remain in jail despite a ruling demanding their release. The villagers were detained in September, 2013, after protesting against an iron mining company named Paradox Global Resources S.A. de C.V., a wholly owned subsidiary of the Chinese industrial conglomerate Rizhao Xingye Import & Export Co. The villagers are “ejidatarios”, or members of an ejido, which is a collective form of land ownership established in Mexico after the revolution a century ago. They had been protesting the company’s breach of contract and refusal to transfer any financial benefit to their small village, which numbers about 350 inhabitants. Specifically, the community was promised two dollars per ton of iron ore extracted from the company’s mine, paved streets, an expanded medical clinic, as well as an improved electrical grid and water system. The community claims that the land initially fell into the mine’s hands as a result of a fraud, with the company’s legal representative in Mexico, Ms. María Hermila Gámez Rodríguez, having used forged documents to gain title to the 40 hectares on behalf of the Chinese company. Despite this accusation, which has not been investigated by the courts, the State government has been playing hard ball, using armoured vehicles to intimidate and arrest the unarmed civilian population. Four months ago, on December 12, 2013, a judge in Sinaloa’s sixth district in Los Mochis, Fernando Alcázar Martínez, granted the villagers an “amparo”, which is a type of bail that protects them from detention. A lawyer for the group, Eleazar Mendoza, says that the reason they remain incarcerated is due to a conflict of interest in which the legal team representing the mine also works for the governor of the state within the attorney general’s office. In effect, the chief prosecutor for the state is also a client of the mine. The villagers were arrested in September, 2013, while blocking mine access. The protesters were charged with “aggravated theft” or “plunder”, a serious crime, but the judge granted the amparo due to the fact that, in his consideration, there was no evidence that a crime even occurred. On Wednesday, March 12, their lawyer took the case to federal court in Mazatlán, demanding their release. As of Monday, March 17, there has been no decision. In December a spokesperson for an agricultural tribunal, Fernando Hernández Reyes, confirmed a ruling that found Paradox Global Resources had breached the contract stipulating that it install services in the community. The fact that the contract had not been fulfilled was acknowledged by the mining company’s lawyer, Jironavo Montoya Castro, who nonetheless insisted that the company would fulfill its obligations at a later date. The company was perhaps surprised that the ejido was able to defend itself: their lawyer, Gervasio Osuna Contreras (secretary of the Confederación Nacional Campesina, which represents small farmers and peasants) had been thrown in jail, and there was an arrest warrant out for their leader. Anticipating this intimidation, the ejido had prepared for a third party to appear and defend them in court. The first large-scale protest occurred back in August, 2013, when the entire community showed up to complain that a bond promised six years ago had yielded nothing. Villagers, including women and children, blockaded the road to the mine and put up banners accusing the government of corruption and asking that the Chinese company live up to its obligations. La politica has reached out to Rizhao Xingye Import & Export Co., which is a subsidiary of Xingye Group, but has received no response as of yet. The Sinaloa governor, Mario López Valdez, has insisted that the detained villagers must sit down and “talk”, but has refused to address any of the substantive issues. For their part, the ejidatarios have expressed concern that the governor has turned a blind eye to their plight. 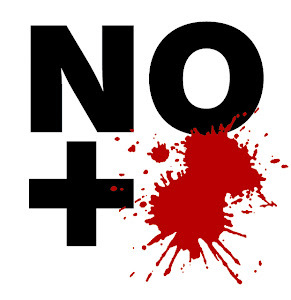 López Valdez is with the pro-business, right-of-centre National Action Party (PAN), which is on friendly terms with the Chinese government, as was shown on March 3 when the Chinese ambassador to Mexico, Qiu Xiaoqi, met with the party’s national leadership.